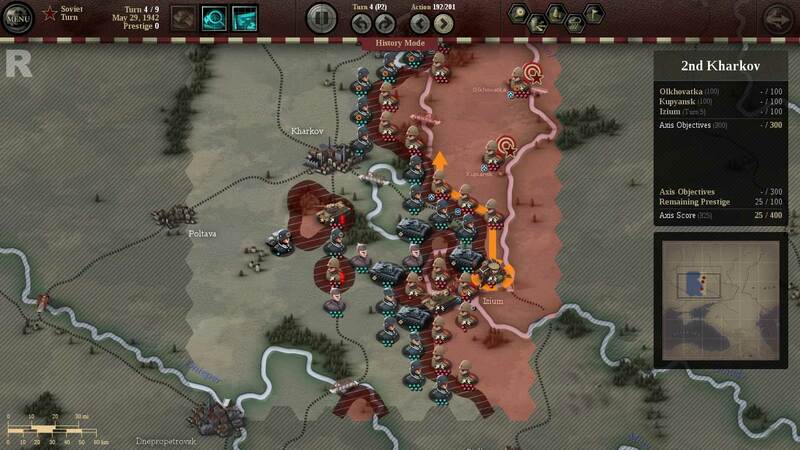 Izium fell on the first week of June1942 to a backdrop of ferocious attacks and counterattacks. The human toll has been horrendous, the enemy too obstinate to give up ground. Before we dive into the highlights of the operation, a note about combat. Unit of Command uses a combat results table (CRT) that is based in odds. These odds determine die rolls that will result in units' "steps" eliminated or suppressed. Factors like training, armor, terrain and weather produce shifts in the die rolls. The combat odds are displayed in the right window (see screenshot above) and it's pretty intuitive to figure out how combat will turn out. In the screenshot above, the attacker is unlikely to loose steps (blue dots) and the defender will likely loose three steps (red Xs). The offensive started well for us (I'm playing as the Germans), but by no means we have achieved operational depth. The computer-controlled Soviet forces respond to our breakthrough by moving a tank corps from the north down to the threatened break in the front line. Be ready to deal with these type of high mobility responses from the AI. 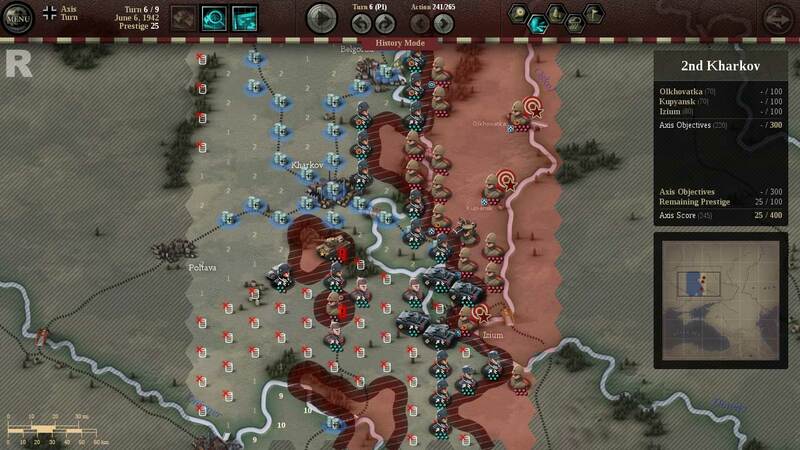 As you may have noticed from the previous screenshot, the Soviets responded in kind with an spirited counter-attack aimed at our best supply source east of Dnperopetrovsk. In this screenshot, the Soviets bring their point home with additional partisan operations. 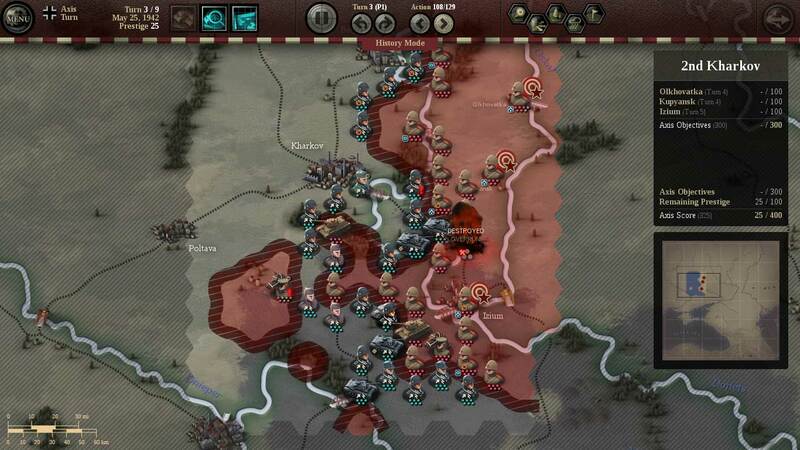 The Soviet penetration southwest of Izium is dealt with, but heavy losses are starting to become too common. 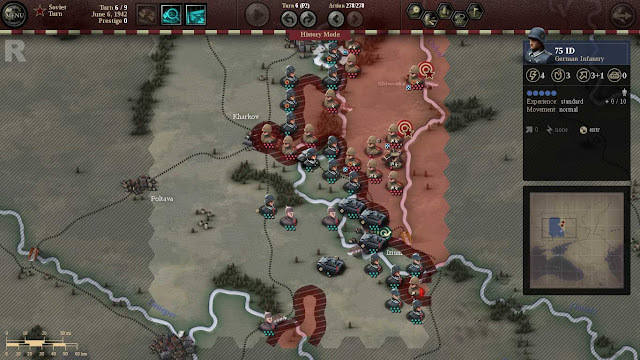 Note how the German units have an exclamation point in their icon: they were out of supply at the beginning of the turn. This is a reminder of how fragile and dependent on our southern supply source our logistics are. 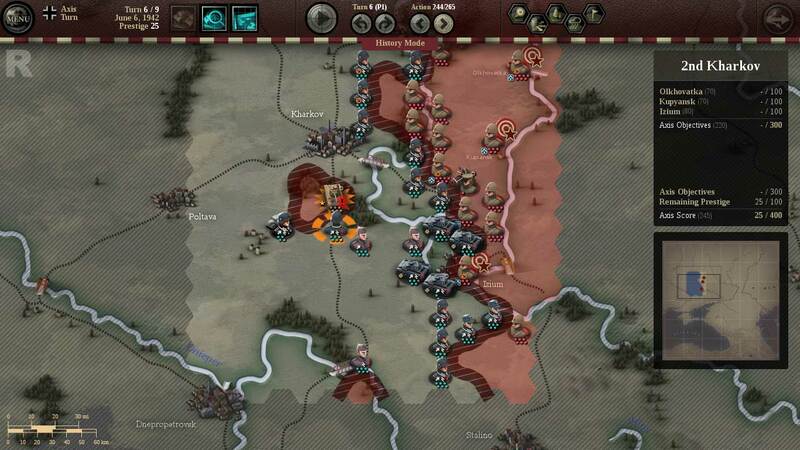 Note how I moved all divisions in our right flank to the west. 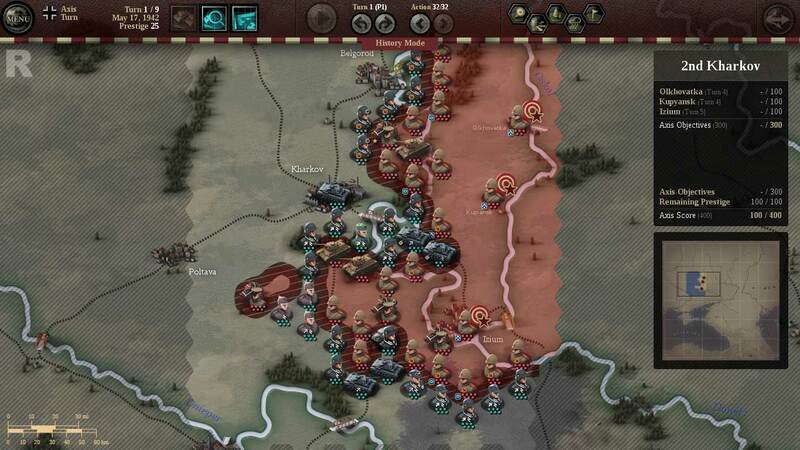 This was to avoid these units being encircled by the Soviets. Busy as the Soviets are near Izium, an encirclement was unlikely. Better safe than sorry. A culmination point in our offensive towards Izium: the destruction of the Soviet 7th Tank Corps by the 22 Pz.Div. Now the Soviets are limited in mobility and offensive capacity. The northern pincer aiming at Izium is thin as a thread, but the Soviets are showing signs of wavering. Note the Soviet cavalry corps bugging out north (orange highlight). Our pressure on Izium is increasing from the south too, but in this case in the form of a continuous frontline. 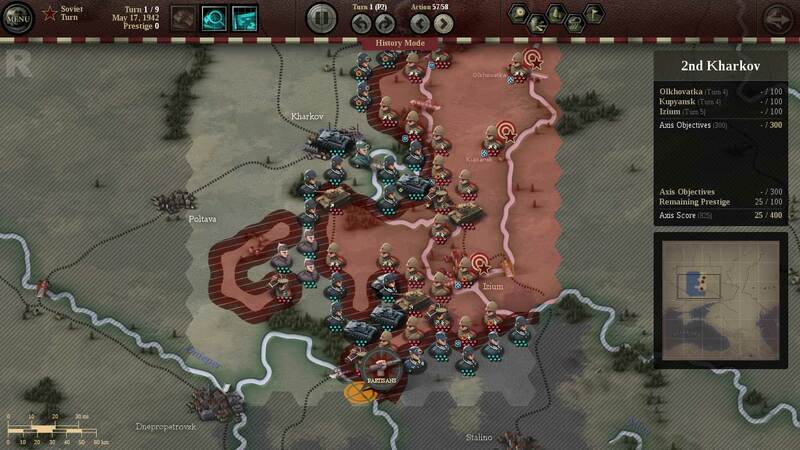 South of Kharkov, the Soviet 23rd Tank Corps and Army Group Bobkin are completely isolated. Soviet partisans (red area east of Dnperopetrovsk) wreck havoc with our logistics. The areas with barrels crossed with a red x are now out of supply. Fortunately, I have left some Romanian infantry forces in the rear to deal with the pesky partisans. The fall of Izium is now imminent. The German 298th Infantry Division (highlighted orange) mops up the remnants of the Soviet 23rd Tank Corps. The latter unit has been isolated for at least three turns. The good news: Izium falls into our hands. 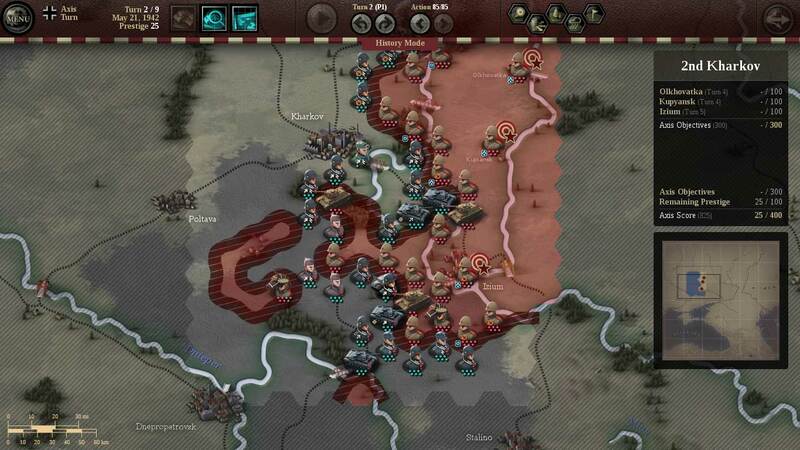 The bad news: 3 Soviet Infantry Corps from the 6th, 21st and 28th Armies have counterattacked and taken Kharkov. You conquered it on turn 6, that doesnt give you additional prestige. Anyone who was succesfull in gaining prestige in the first mission? I dont get into the objectives early enough. 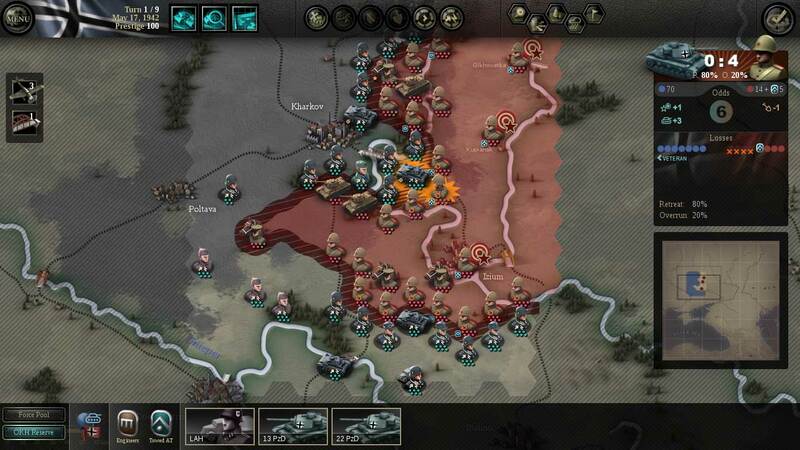 In the scenario I had 295 points, with 300 required to make am impression on High Command. I did better on the follow-up. The AI can be surprisingly aggressive, if you leave an opening; I found that out on my first "practice game". Hey bro, didn't know if you knew this or not, but if you want users to be able to click on a single image and bring up just that image and not the the black slide show thing, go to Settings/Formatting/Showcase Images with Lightbox and select "NO".